That’s why today, we’re here to recognise the Top Mechanics in Perth. We’re here to recognise the Top Mechanics In Perth, who went above and beyond to consistently deliver amazing service experiences to their customers. Coming in as the Top Mechanic in Perth is Osborne Park Isuzu. Osborne Park Isuzu is a family owned business and have always believed in actively supporting their local community. They understand that without you, they wouldn’t exist today. As such, they will always put their customers and community first. They have been industry leaders in servicing light commercial Isuzu Utes for over 50 years, and are now proudly servicing cars of ALL makes and models - so that we can give everyone the peace of mind we provide to all of our Isuzu guests! Barry and the team have an awesome 4.7 star rating on AutoGuru, check out one of their great 5 star reviews! Sims Auto offer servicing and repairs to all makes and models, and in addition to general repairs and maintenance also carry log book servicing. Owner Simon Cuthbert leads a team of highly trained mechanical technicians. The team at Sims Auto know their stuff and are always kept up to date with all the latest diagnostic equipment and technology. Sims Auto also offer tune ups, timing belts, EFI diagnostics and repairs, cooling systems, brakes and clutch, air conditioning, suspension, exhaust systems, and batteries. They strive to deliver the highest levels of customer service and peace of mind in knowing your vehicle is in safe hands. Sims Auto has a great 4.9 star rating on AutoGuru, have a read of an awesome review below! 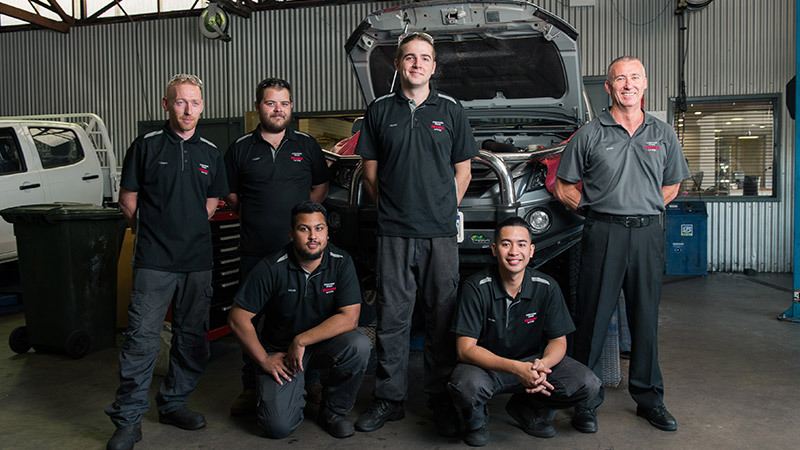 The Vehicool team have been servicing cars in and around Perth for more than 10 years and have built a reputation of excellence in the automotive industry. Their clean, well-equipped workshop, quality of work, attention to detail, and strong commitment to customer service is a source of pride for Cameron and the crew. Being family-owned and operated, all of their services comes with a personal touch. In addition to air conditioning service Vehicool carry out repairs and maintenance on all vehicle makes and models, and with a 4.9 average star rating, you know you’re in safe hands. Here’s a great review for the team! Battery and Auto Services specialise in Logbook Servicing and Mechanical repairs. Sal and the team of trained and qualified mechanics are happy to inspect and quote you on any servicing and repairs required to get your car going smoothly again. Their workshop is fully equipped to deal with all cars and they also conduct a free brake, battery and under bonnet check. The teams workmanship is fully guaranteed and we use the most trusted oil and filter types. Their reasonable service prices will always put a smile on your face. Battery and Auto Services guarantees customer satisfaction always. They also offer a free vacuum, drop off and pick up service for customers. Battery and Auto Services has a 4.7 star rating on AutoGuru, with some great reviews from customers. Owner Gary Conway and his team of qualified mechanics at ABS Kewdale have been looking after the Kewdale community for over 10 years. They offer log book servicing, brakes, clutch, wheel alignment, suspension, batteries, tyres and all general repairs to most vehicle makes and models. They know people are busy with work and family commitments, so they’re open Monday to Saturday and are conveniently located near Abernethy Road bus transport. Their customers aren’t just Kewdale residents, they come from Belmont, Cannington, Cloverdale, Queens Park, and Victoria Park. The workshop includes 7 service bays, attended to by 7 highly qualified mechanics. With a 4.7 star rating on AutoGuru, you can see why customers love ABS Kewdale! Automotive Mechanical Electrical (AME) has been a family-owned business specialising in automobile mechanics for over 30 years. Their outstanding reputation is founded on providing clients with exceptional customer service, quality workmanship and honesty. Their focus is on giving their clients the best car service experience in Perth! AME is dedicated to looking after customers and their cars by providing a full range of expert vehicle servicing and repairs, on most makes and models. Being part of the Repco Authorised Service group, AME is constantly up-to-date with new car models and makes, the ins and outs of car servicing, with technicians frequently attending Repco clinics. Anthony and the team prides themselves on their promise to do the right thing by their customers. Check out this great review below. Autotune Mechanical & Electrical Repairs offers auto electrical and mechanical servicing and repairs, air-con service, log book servicing, tyres, brakes and suspension repairs and service. They have 22 years experience in the automotive trade and have qualified electricians and mechanics. Wing and the team have flexible working hours, being open from Tuesday to Sunday, excluding Public Holidays. Autotune Mechanics & Repairs is focused on the cars they work on, as well as the people who drive them. They aim to establish long-term relationships with our customers, and to achieve that goal, they will strive to consistently offer great service experiences. Here’s an awesome review for the crew! We offer all types of car servicing in Cannington and surrounding areas of Bentley, Welshpool and Beckenham. Loan car available to be pre-booked, local 5km drop off for your convenience and free car wash.
Owners Anthony and Jason bring over 18 years of extensive mechanical knowledge with a high degree of quality customer service. Offering a wide range of affordable, reliable and high quality auto services and repairs, this means you can rely on their expertise and experience to make sure you’re not being taken advantage of with repairs that are not required. The team at Cannington Performance Service & Repairs pride themselves on honest and reliable advice when it comes to mechanical repairs. Check out one of their great reviews on AutoGuru! Love your car? So does SanCo Mechanical Services! They are your fully licenced and insured independent auto service center. Their level of personalised service is claimed to be second to none, and their attention to detail is what sets them apart from the crowd. Lour and the crew pride themselves on treating each and every vehicle that enters their workshop as if it was their own, and they always ensure that any work carried out on your vehicle is of the highest standard. At SanCo they know that there are no shortcuts to happiness. Whether it's your daily driver, weekend workhorse or your special pride and joy, they guarantee you will love the work we do! Their 4.9 star rating tells us that customers must be loving the team at SanCo! Auto Owls is a family owned and run, independent workshop servicing Welshpool and surrounding areas. They are Perth's first & only 24 hour licensed Mechanical and Auto electrical workshop. They are open when it suits you, for your convenience, and their core values are Honesty, Reliability and Integrity. Jesse and the team have over 40 years of combined experience, ensuring that you and your car will always get the high-quality service that you deserve! Whether it be logbook servicing, mechanical repairs, Auto Electrical, air conditioning or just about anything else, Auto Owls is here to help. Have a read of one of their great reviews on AutoGuru. Data recorded on January 31st, 2019. Looking for a mechanic in Perth?